Cape Town (Afrikaans: Kaapstad; Xhosa: iKapa) is one of South Africa's three capital cities, serving as the legislative capital and seat of the National Parliament, as well as the provincial capital of the Western Cape. The second most populous city in the country, it is famous for its harbor and for landmarks such as Table Mountain and Cape Point, and is one of the most popular South African tourist destinations. Cape Town was originally developed as a supply station for Dutch ships sailing to Eastern Africa, India, and the Far East more than 200 years before the Suez Canal opened in 1869. Jan van Riebeeck's arrival in 1652 established the first permanent European settlement in South Africa. Cape Town is well-known for its history of apartheid, a system of legalized racial segregation enforced by the National Party government of South Africa between 1948 and 1994, and was home to many leaders of the anti-apartheid movement. Numerous famous political prisoners were held for years on Robben Island, a penitentiary island about six miles (10 km) from the city. One such former prisoner, African National Congress leader Nelson Mandela marked the end of apartheid in a public speech on February 11, 1990, from the balcony of Cape Town City Hall hours after being released from prison. While Cape Town in the early twenty-first century has an economy that surged to unprecedented levels due to the boom in the tourism and the real estate industries, daunting economic problems remain. The unemployment rate is nearly 20 percent, with the majority of the affected being non-white. The lack of economic empowerment among the disadvantaged groups is linked to the poor uptake of education. More fundamentally, prosperity is likely to increase once the city deals with violent drug-related crime, reduces the homicide rate from one of the highest rates in the world, and wins its struggles against tuberculosis and HIV/AIDS. 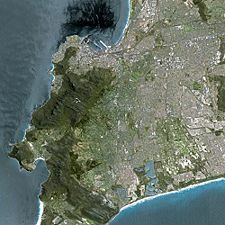 Cape Town seen from Spot satellite. A NASA satellite image of Cape Town and its environment taken by a Landsat satellite in February 2000. Cape Town is located at the northern end of the Cape Peninsula, about 30 miles (50km) north of the Cape of Good Hope. Table Mountain forms a dramatic backdrop to the city bowl, with its plateau over 3,300 feet (1,000 meters) high. It is surrounded by near-vertical cliffs, Devil's Peak and Lion's Head. Sometimes a thin strip of cloud forms over the mountain; this is colloquially known as the "tablecloth." The peninsula consists of a dramatic mountainous spine jutting southward into the Atlantic Ocean, ending at Cape Point. There are over 70 peaks above 1,000 feet (300 meters) within Cape Town's official city limits. 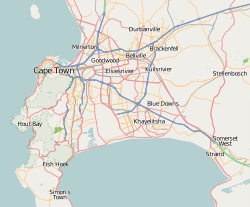 Many of the suburbs of Cape Town are on the large plain of the Cape Flats, which joins the peninsula to the mainland. The Cape Flats lie on a rising marine plain, consisting mostly of sandy surface, indicating that at one point Table Mountain itself was an island. Cape Town covers 948 square miles (2,455 square kilometers). Environmental issues involve water. The lack of important arterial rivers or lakes requires extensive water conservation and control. The Cape Peninsula has a Mediterranean climate with well-defined seasons. In winter, which lasts from May to September, large cold fronts come across from the Atlantic Ocean with heavy precipitation and strong north-westerly winds. Summer, from November to March, is warm and dry. The peninsula gets frequent strong winds from the south-east, known as the Cape Doctor, because it blows away pollution and cleans the air. The only times when Cape Town can be uncomfortably hot is when the Berg Wind blows from the Karoo interior for a couple weeks in February or early March. Temperatures in July range from 48°F to 63°F (9°C to 17°C), and in January 61°F to 79°F (16°C to 26°C). Mean annual precipitation is 24 inches (600mm). 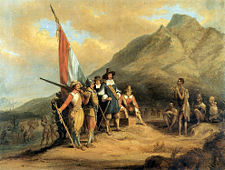 A painting of the arrival of Jan van Riebeeck in Table Bay (by Charles Bell). Stone Age hunter-gatherers who used stone tools and fire arrived in the Western Cape area around 100,000 B.C.E. They survived the Ice Age, when water levels were around 120 meters lower than their current levels. Fossils indicate that by 8000 B.C.E., the inhabitants had developed bows and arrows for hunting. Nearly 6,000 years later, a large migration of tribes further inland brought contact with skilled agriculturalists, prompting cape inhabitants to grow crops. Bartholomeu Dias from Portugal sailed around the southernmost tip of Africa in 1486, the first European known to have done so. He was followed by Vasco da Gama in 1497, while he was searching for a route that would lead from Europe to Asia. Portuguese admiral Antonio da Saldanha named Table Mountain in 1503. The Khoi inhabitants, who were were herders, hunters and gatherers, called it Hoeri 'kwaggo ("sea mountain"). On April 6, 1652, Jan van Riebeeck and other employees of the Dutch East India Company arrived to establish a way-station to provide fresh water, vegetables, and meat for ships traveling to the Dutch East Indies. The group erected shelters and laid out vegetable gardens and orchards, and bartered with the Khoi people for sheep and cattle. Forests in Hout Bay and the southern and eastern flanks of Table Mountain provided timber for ships and houses. The Dutch called the indigenous Khoi people "Hottentots." The city grew slowly during this period. A labor shortage prompted the city to import slaves from Indonesia and Madagascar. Many of these became ancestors of the first Cape Coloured communities. During the French Revolutionary and Napoleonic wars, the Netherlands was repeatedly occupied by France, and Great Britain moved to take control of Dutch colonies. Britain captured Cape Town in 1795, but the Cape was returned to the Netherlands by treaty in 1803. British forces occupied the Cape again in 1806. In the Anglo-Dutch Treaty of 1814, Cape Town was permanently ceded to Britain. It became the capital of the newly formed Cape Colony, whose territory expanded substantially through the 1800s. The discovery of diamonds in Griqualand West in 1869, and the Witwatersrand Gold Rush in 1886, prompted a flood of immigrants to South Africa. Conflicts between the Boer republics in the interior and the British colonial government resulted in the Second Boer War of 1899-1901. Britain won the war. In 1910, Britain established the Union of South Africa, which unified the Cape Colony with the two defeated Boer Republics and the British colony of Natal. Cape Town became the legislative capital of the union, and later of the Republic of South Africa. In the 1948 elections, the National Party won on a racial segregation platform known as apartheid. This led to the Group Areas Act, which classified all areas according to race. Formerly multi-racial suburbs of Cape Town were either purged of unlawful residents or demolished. The most infamous example of this in Cape Town was District Six. After it was declared a whites-only region in 1965, all housing there was demolished and over 60,000 residents were forcibly removed. Many of these residents were relocated to the Cape Flats and Lavendar Hill. Under apartheid, the cape was considered a "Coloured labour preference area," to the exclusion of "Bantus" (blacks). Cape Town was home to many leaders of the anti-apartheid movement. Numerous famous political prisoners were held for years on Robben Island, a penitentiary island about six miles (10km) from the city. One such former prisoner, African National Congress leader Nelson Mandela marked the end of apartheid in a public speech on February 11, 1990, from the balcony of Cape Town City Hall hours after being released. The first post-apartheid election was held four years later, on April 27, 1994. 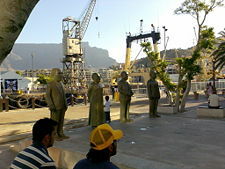 Nobel Square in the Victoria & Alfred Waterfront features statues of South Africa's four Nobel Peace Prize winners—Albert Luthuli, Desmond Tutu, F.W. de Klerk, and Nelson Mandela. Since 1994, the city has struggled with problems such as HIV/AIDS, tuberculosis, a surge in violent drug-related crime and more recent xenophobic violence, which has given the city one of the highest homicide rates in the world. At the same time, Cape Town's economy has surged to unprecedented levels due to the boom in the tourism and the real estate industries. The Grand Parade and Cape Town City Hall, with Table Mountain and its characteristic tablecloth in the background. South Africa is a republic in which the president is both the chief of state and head of government, and is elected by the National Assembly for a five-year term. The bicameral Parliament consists of the National Assembly of 400 members, elected by popular vote under a system of proportional representation to serve five-year terms, and the National Council of Provinces of 90 seats, with 10 members elected by each of the nine provincial legislatures for five-year terms. Cape Town is one of South Africa's three capital cities, serving as the legislative capital and seat of the National Parliament, as well as the provincial capital of the Western Cape. The others are Pretoria, the executive (administrative) and de facto national capital, and Bloemfontein, the judicial capital. Cape Town is a metropolitan municipality governed by a 210-member city council, which reports to a 28-member executive council. The executive council, in turn, is presided over by a city manager and an executive mayor. The city is divided into 105 electoral wards; each ward directly elects one member of the council, while the other 105 councilors are elected by a party-list proportional representation system. The mayor is chosen by the city council. 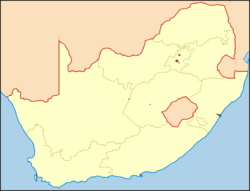 Before the unification of Cape Town's local government into the so-called "unicity," it was divided into six regional "administrations"; many functions of the unicity are still divided according to the old administrations, which were Cape Town, the South Peninsula, the Blaauwberg region, Tygerberg, Oostenberg, and Helderberg. After the unification, 16 sub-councils were formed, and later increased to the present 23. Sub-councils consist of geographically clustered wards, with councilors assigned to them on a proportional basis. Each sub-council is led by a chairman who is elected by a majority vote of each sub-council. Panorama across the Victoria Basin at the Victoria & Alfred Waterfront, with Table Mountain in the background. South Africa is a middle-income, emerging market with an abundant supply of natural resources, as well as well-developed financial, legal, communications, energy, and transport sectors. Cape Town serves as the regional manufacturing center, has the primary harbor and airport in the area, and has a large government presence. Cape Town has four major commercial nodes, with Cape Town Central Business District containing the majority of job opportunities and office space. Century City, the Bellville-TygerValley strip, and Claremont commercial nodes contain numerous offices and headquarters of insurance companies, retail groups, publishers, design houses, fashion designers, shipping companies, petrochemical companies, architects, and advertising agencies. Cape Town has a petroleum refinery, as well as chemical, fertilizer, cement, and automobile-assembly factories. Other industries involve ship repair, food processing, wine-making, and the manufacture of clothing, plastics, and leather goods. Koeberg Nuclear Power Station provides most electricity for Cape Town, which also has a coal-fired power station and two gas turbines. Oil and natural gas was discovered off the coast. The city’s water comes from dams on Table Mountain and Steenbras, as well as from Riviersonderend, Voëlvlei, and Wemmershoek. Cape Town is a popular tourist destination due to its good climate, natural setting, and relatively well-developed infrastructure. Attractive features include Table Mountain, the dramatic headland at the end of the Cape Peninsula, Chapman's Peak Drive, Cape Town's beaches, as well as several notable cultural attractions. Tourism accounts for 9.8 percent of the GDP of the province and employs 9.6 percent of the workforce. 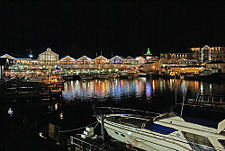 Approximately 1.5 million tourists visited in Cape Town during 2004, bringing in a total of US$1.27-billion in revenue. The median annual income of working adults aged 20–65 was US$3289 (South African rand 25,774. South Africa's per capita GDP was estimated at US$9800 in 2007. The Western Cape generates a quarter of South Africa's agricultural total gross income and more than half of South Africa's exports, which are handled through the Port of Cape Town or Cape Town International Airport. The Port of Cape Town, which is located in Table Bay directly to the north of the central business district, is on one of the busiest shipping corridors in the world. It is a busy container port, second in South Africa only to Durban. In 2004, it handled 3,161 ships and 9.2 million metric tons of cargo. Simon's Town Harbour on the False Bay coast of the Cape Peninsula is the main base of the South African Navy. Cape Town International Airport serves both domestic and international flights, and is the second-largest airport in South Africa. Two long-distance passenger rail services operate from Cape Town. Metrorail, which operates a commuter rail service in Cape Town and the surrounding area, has a network of 96 stations. Three national roads have their start in Cape Town: The N1 links the city with Bloemfontein, Johannesburg, Pretoria, and Zimbabwe; the N2, to Port Elizabeth, East London and Durban; and the N7, to the Northern Cape Province and Namibia. Cape Town also has a system of freeway and dual carriageway M-roads. According to the South African National Census of 2011, the population of the City of Cape Town metropolitan municipality—an area that includes suburbs and exurbs not always considered as part of Cape Town—was 3,740,026 people. With a land area of 948 square miles (2,455 square kilometers) Cape Town had population density of 3,689 people per square mile (1,425 per square kilometer). In 2011, there were 1,068,573 formal households, 78.4 percent in formal structures (houses or flats), with 20.5 percent are in informal structures (shacks). 42.4 percent of the population described themselves as "Coloured" (a label for people of mixed ethnic origin who possess ancestry from Europe, Asia, and various Khoisan and Bantu tribes of Southern Africa, including the distinctive Cape Coloured and affiliated Cape Malay cultures mostly Malayu-speaking Javanese from modern-day Indonesia)," 38.6 percent as "Black African", 15.7 percent as "White", and 1.4 percent as "Indian or Asian". Of those residents who were asked about their first language, 35.7 percent spoke Afrikaans, 29.8 percent spoke Xhosa, and 28.4 percent spoke English. The city is predominantly Christian (76.6 percent). 10.7 percent have no religion, 9.7 percent are Muslim, 0.5 percent are Jewish, 0.2 percent are Hindu, and 2.3 percent have other or undetermined beliefs. Of those residents aged 20 or older, 1.8 percent have no schooling, 8.1 percent have some schooling but did not finish primary school, 4.6 percent finished primary school but have no secondary schooling, 38.9 percent have some secondary schooling but did not finish Grade 12, 29.9 percent finished Grade 12 but have no higher education, and 16.7 percent have higher education. Overall, 46.6 percent have at least a Grade 12 education. Of those aged between 5 and 25, 67.8 percent are attending an educational institution. Amongst those aged between 15 and 65 the unemployment rate is 23.7 percent. Overall, 38 percent of residents aged 20 and over have completed high school, 4.2 percent of residents have received no schooling, 11.8 percent have had some primary school, 7.1 percent have completed only primary school, 38.9 percent have had some high school education, 25.4 percent have finished only high school and 12.6 percent have an education higher than the high school level. Cape Town is served by three public universities: The University of Cape Town, the University of the Western Cape and the Cape Peninsula University of Technology. Stellenbosch University, while not in the city itself, is 50 kilometers from the City Bowl and has additional campuses, such as the Tygerberg Faculty of Health Sciences and the Bellville Business Park closer to the City. Both the University of Cape Town and Stellenbosch University are leading universities in South Africa. The University of Cape Town is an English speaking institution, which has over 9,000 students and has an MBA program that is ranked 51st by the Financial Times in 2006. The University of Cape Town's main campus. Cape Town taxi rank above train station. The Castle of Good Hope is a star fort which was built on the original coastline of Table Bay. Built by the Dutch East India Company between 1666 and 1679, the Castle is the oldest building in South Africa. It replaced an older fort made of clay and timber that was built in 1652 by Jan van Riebeeck upon his arrival. Cape Town has the highest density of Cape Dutch style buildings in the world. 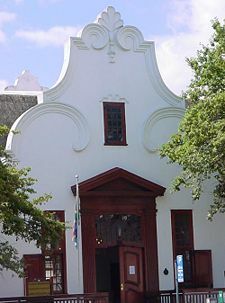 Cape Dutch style, which combines the architectural traditions of the Netherlands, Germany, and France, is most visible in Constantia, the old government buildings in the Central Business District, and along Long Street. The annual Cape Town Minstrel Carnival, also known by its Afrikaans name of Kaapse Klopse, is a large minstrel festival held annually on January 2 or "Tweede Nuwe Jaar" (Afrikaans: Second New Year). Competing teams of minstrels parade in brightly colored costumes, either carrying colorful umbrellas or playing an array of musical instruments. The Artscape Theatre Centre is the main performing arts venue in Cape Town. Cape Town's most popular sports by participation are cricket, association football, swimming, and rugby union. Cape Town has hosted the 1995 Rugby World Cup, 2003 ICC Cricket World Cup, and World Championships in various sports such as athletics, fencing, weightlifting, hockey, cycling, canoeing, gymnastics and others. Cape Town is also a host to the 2010 FIFA World Cup, further enhancing its profile as a major events city. Although Cape Town’s economy has surged to unprecedented levels due to the boom in the tourism and the real estate industries, daunting economic problems remain. Nearly 20 percent of Cape Town residents are unemployed, and of these 58.3 percent of the are black and 38.1 percent are colored. The lack of economic empowerment among the disadvantaged groups is linked to the poor uptake of education—38.9 percent of residents aged 20 and over have only had some high school education. But more fundamentally, prosperity is likely to increase once the city deals with violent drug-related crime, reduces the homicide rate from one of the highest rates in the world, and wins the struggles against tuberculosis and HIV/AIDS. ↑ Pollack, Martin (31 May 2006). Achmat Ebrahim is the new city manager of Cape Town. City of Cape Town Metropolitan Municipality. Retrieved March 25, 2007. ↑ Census 2011 Municipal report: Western Cape, Statistics South Africa, 2012. Retrieved May 6, 2014. Field, Sean, Renate Meyer, and Felicity Swanson. 2007. Imagining the City: Memories and Cultures in Cape Town. Cape Town: HSRC Press. ISBN 9780796921796. Hammer, J., and P.-A. Pettersson. 2008. "Inside Cape Town." Smithsonian 39 (1): 56-67. ISSN 0037-7333. Johannes, Calvin P. E. 2002. The History of the Black Townships and Squattercamps of Cape Town. Cape Town: Southern Tip Tours. OCLC 51778873. McDonald, David A. 2008. World City Syndrome: Neoliberalism and Inequality in Cape Town. New York: Routledge. ISBN 9780415958578.